The Day at our Workshops starts with breakfast in the medieval dining hall. Immediately following will be a demonstration and lesson in watercolor, oil painting or clay sculpture. 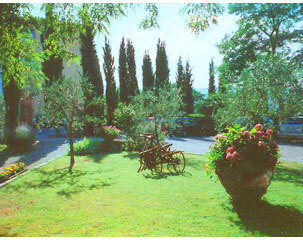 Subject matter includes vineyards, olive groves, the sculptural Chianti valley, 15th century buildings and the lush gardens of the villa where we will be staying in Tuscany. Painting classes will be taught en plein air, but some lectures may be given indoors. There will be a critique in the late afternoon. Dinner is at 8PM. In the evening there will be a slide lecture, social time, and an evening stroll. When we are not painting, cooking or sculpting we will be taking day trips in Tuscany to Siena, the medieval jewel, and Florence, the cradle of Renaissance art. 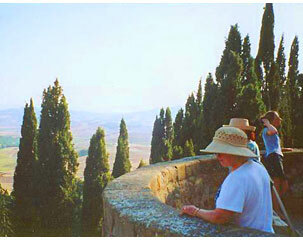 The Trip Coordinator, Carol Marano has spent many years living, studying and working in Tuscany. She is fluent in Italian and is there to assist you in every way to make your learning vacation as comfortabsle and memorable as possible. Carol is an artist and a teacher from Huntington, Long Island. She holds a masters degree in Art Education from Columbia University in New York and has done advanced graduate work in Renaissance art history. She has been painting in watercolor and oils for over twenty years and has exhibited her work in New York and abroad. She has led many successful trips throughout Italy over the past ten years. She attended L'Università degli Studi, Siena, Italy in 1978 where she became fluent in Italian language. Tuscan Cooking School with world-renowned Tuscan chefs are held in English in the villa's kitchen where the freshest organic ingredients are used to create typical regional cuisine. Cooking class participants work hands-on in the creation and preparation of authentic Tuscan specialties, including antipasti, home-made pastas and accompanying sauces, open-fire grilled meat specialties, rustic salads, and dessert favorites such as tiramisù and cantucci (almond biscotti). All cooking lessons include lunch and wine. 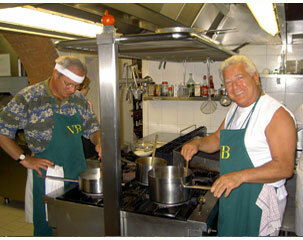 For more information, see a description of our cooking classes and wine tastings. This year the Tuscan Workshops is pleased to offer the outstanding instruction of Abstract Painter, Ellen Hallie Schiff. Ellen is a Long Island native who lives and works in Glen Cove, Long Island. She teaches Contemporary Art Making at The Artist’s Studio art school on the grounds of Chelsea Mansion and Muttontown Preserve in East Norwich, Long Island. Ellen began her painting career as a realist, and gradually found herself in the world of Abstract Painting by following her natural curiosity about the paint, composition and communicating ideas. Her painting is known for it’s drama, energy, emotion and compelling tone. Ellen’s love of the materials of painting is evidenced by her swaths of colorful paint, highly textured surfaces and sensual gestural marks. Her passion about making abstract art and communicating that which cannot be spoken has driven her career. In fact, one of her paintings had been featured on WCBS-TV’s THE GOOD WIFE for several years. 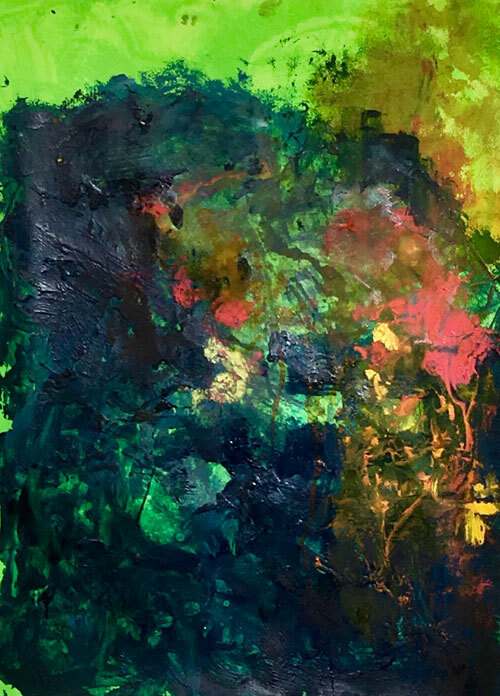 Within the past several years, Ellen discovered the incredibly exciting world of teaching Abstract Painting. She teaches “Explorations in Water-based Enamel” workshops across Long Island and has a filled to bursting class of students at THE ARTIST’S STUDIO art school who are devoted to her and her generous teaching style. Ellen’s sense of excitement in creating art is palpable and is conveyed to her students every week. “In her paintings, Ellen takes a broad view of history and brings us full circle from the deteriorating boundaries of the distant past to the commanding focus of the present.” F. Coleman, Art Dealer and Gallerist. Renee Phillips, Manhattan Art International. Ellen’s work has been exhibited internationally and is in public and private collections world-wide. She is represented on Long Island by Ripe Gallery; in Philadelphia by Pii Gallery and in Munich by M. Leinfelder. Ellen is Vice President of The Art Guild of Port Washington and on the Art Advisory Council of the Port Washington Library- the group that curates the Library’s art exhibits. The Tuscan Workshops is happy to introduce our yoga instructor Mary Grace. Born on the day of the Spiritual Warrior, Mary Grace has dedicated her life to health and positive thinking along with the art & science of yoga. She began her travels at a very early age to Israel, Egypt, Mexico, Hawaii & all over the world studying religion & exploring what inspires people, through spirituality, art & food. She was certified in 2000 by Bikram, the worlds most famous Hot Yoga guru. She trained extensively in Mysore, India with the late Sri Pattabhi Jois. Mary Grace's certifications include Bikram, Ashtanga, and Baptiste yoga, as well as kundalini & restorative yoga and Thai Massage. She artfully blends spirituality with fun and play. She owns and operates several yoga studios covering the globe. 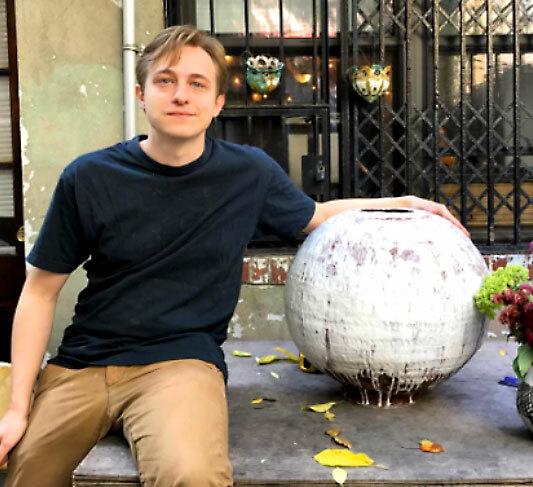 Born and raised on the Upper West Side of Manhattan, Haakon Lenzi was first exposed to the potters wheel in high school and has been throwing his life away ever since. Haakon received a BFA in ceramics from the New York State College of Ceramics at Alfred University where he was greatly influenced by his studies in printmaking, sculpture and anthropology. He then continued his studies in an independent study at Columbia University's Teacher's College. Haakon has been a visiting artist at Goggle Works and Columbia University’s Teacher’s College and has exhibited nationally, including The Jane Hartstok Gallery in New York City, The Northern Clay Center in Minneapolis as well as NCECA (The National Council on the Education of the Ceramic Arts). Currently he is a faculty member of Greenwich House Pottery in New York City. Haakon maintains an active studio practice in his East Harlem “El Barrio” studio where he produces his signature Lenziware pottery, combining his love for historical ceramics with the visual and cultural density of his hometown. The ancient art of fresco painting dates back to Roman times and was brought to perfection during the Italian Renaissance. This luminous, clear, earthy technique is an artist's victory which surpasses the limitations of more conventional mediums and challenges the artist with its spontaneity and transparency. We will have the option of working on lighter weight, portable panels constructed with stretcher strips and a support, or working directly on terracotta tiles, also portable but somewhat heavier. We will prepare our own supports, mix lime plaster and work with pure ground pigments (diluted) in the same way as Michelangelo and Tiepolo. During our excursion days, we will visit in situ several 14th century frescoes in Siena and Florence.